Recently Interpine completed a soil carbon survey for the Ministry for the Environment (MfE) as part of New Zealand’s carbon monitoring system, known as the LUCAS programme. This involved sampling throughout planted forest sites across Northland, Bay of Plenty, Gisborne and Hawkes Bay. The sites were selected from the planted forest plot network to help fill a data gap in the LUCAS soils data set for post-1989 forests in order to provide an estimate of soil organic carbon (SOC) change following afforestation. The survey involved collection of samples across four quadrants. At each quadrant 100mm (soil weight) and 25mm (soil chemistry) cores were taken in 10cm increments down to 30cm – one 100mm core and eight 25mm cores as per plot layout below. The 10cm increments for each of the eight 25mm cores were combined for the three sampling depths (0-10cm, 10-20cm 20-30cm). To help assist in recording the survey Photo’s were taken of the sample pit down to 30cm showing the clean face prior to extraction of the 100mm cores and also of the sampled area (including soil mineral cores) following extraction. This innovation proved extremenly useful in validating lab results post collection and also providing a resource of information for further analysis of the site. Improvement in the equipment were also developed with a change in the design of the core extraction caps used both in terms of material and design, thus making the work more efficient and with less chance of contamination. Example of a 100mm Core Collection with the redesigned core sample caps. 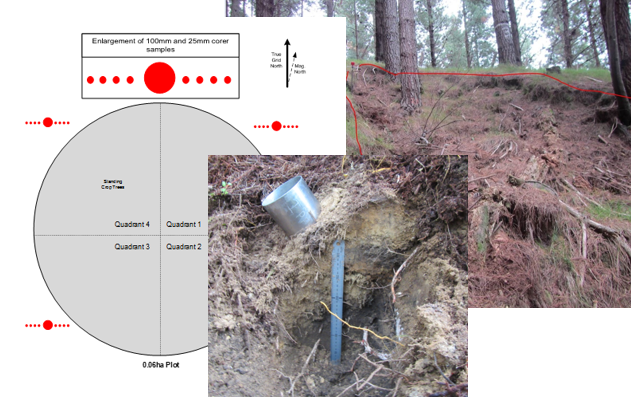 Soil weight and Organic Carbon and Total Nitrogen analysis was carried out by the Landcare Research Environmental Chemistry Laboratory in Palmerston North and from that bulk density and Carbon and Nitrogen stocks (Mg/ha) calculated for each site. 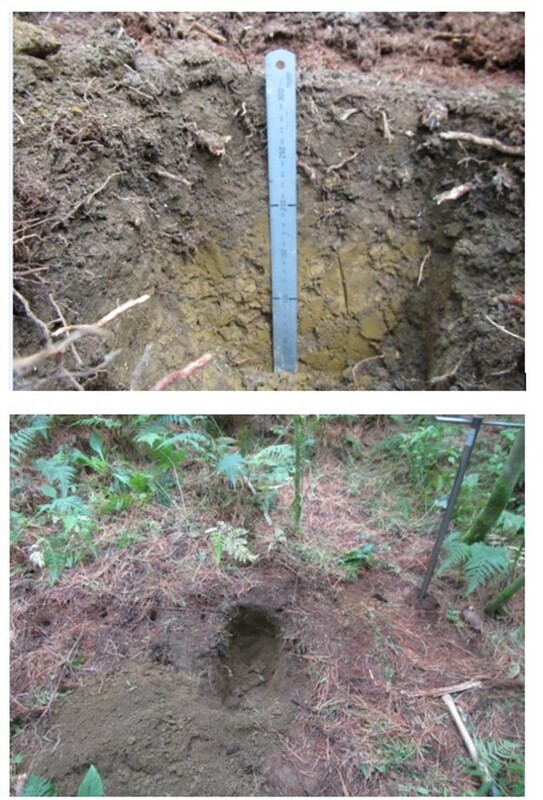 If you would like more information on soils sampling for Carbon inventory then feel free to contact our team.